The highest denomination of any coin in U.S. history, the American Platinum Eagle features a front-facing view of Lady Liberty on the obverse, designed by U.S. Mint Engraver John Mercanti. The reverse, designed by Thomas D. Rodgers, depicts an eagle, wings outstretched as it soars above the earth and sun. Beginning in 1998, the reverse of the proof issues were changed and called "Vistas of Liberty" and consisted of five different design changes. 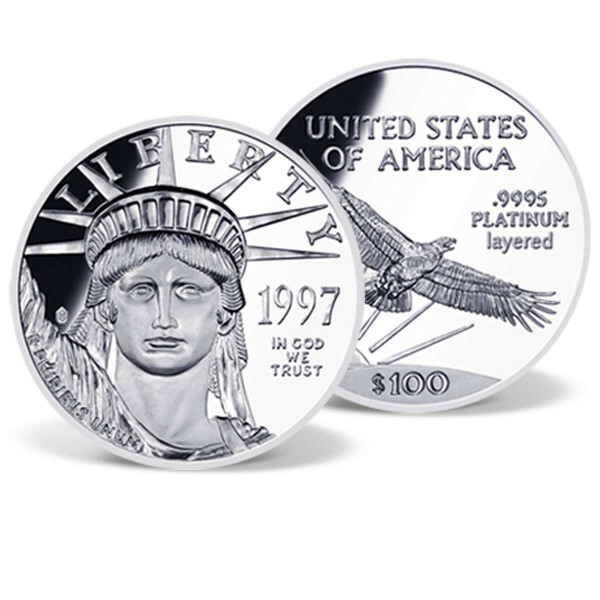 The American Platinum Ealge was first issued in 1997 as an extension of the American Eagle Bullion Program. It is the only investment grade platinum coin issued by the U.S. Mint. This popular extension of the American Eagle Bullion Program is sold in four denominations with the one ounce coin carrying the highest face value ever created on anAmerican coin.